This article is about the term anagarika in general. For the Sri Lankan Buddhist revivalist and writer, see Anagarika Dharmapala. In Theravada Buddhism, an Anagarika (Pali: anagārika/ā; lit., "homeless one", Sinhala: අනගාරික (Anagarika)-male, අනගාරිකා (Anagarikā)-female) is a person who has given up most or all of his worldly possessions and responsibilities to commit full-time to Buddhist practice. It is a midway status between monk and layperson where one takes on the Eight Precepts for the entire anagarika period, which could be for life. Anagarikas usually wear white clothes or robes, depending on the tradition they follow. Some traditions have special ordination ceremonies for anagarikas, while others simply take the eight precepts with a special intention. In monastic settings, lay attendants for monks or nuns are needed. The monastic rules restrict monks and nuns from many tasks that might be needed, including the use of money, driving, cooking, digging and cutting plants, so lay attendants help bridge this gap. Anagarikas differ from laity by their commitment to Buddhism, to their precepts and to the monastics. There is usually a notable difference in their manner, appearance and attire. 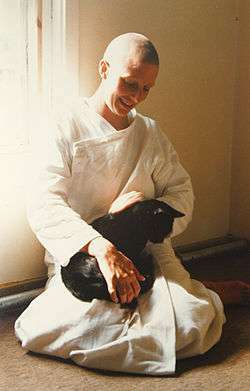 In most cases, they are full-time residents at the monastery where they ordained. Anagarikas often have the intention of becoming a monk or nun at a later point, though not always. In some monasteries a period as an anagarika, often one year, is required in order to take novice ordination. The main difference between the eight precepts of an Anagarika and the 10 precepts of a novice monk is the rule of not handling money. Therefore, anagarika ordinations usually take place in forest monasteries where the monastic rules, including the one on not handling money, are strictly followed. "Monastic: Training," from "BuddhaMind Info"
"Anagarika Life," from "Abhayagiri Monastery"